Why am I a TRAINEE? For STRIP CHART data, all new users are required to pass Wizard Training. This helps you learn the basic of preparing images and collecting data. Your user rank will be TRAINEE until you complete this training. You can re-take the wizard training at any time. If you do, your rank will be temporarily set to “Trainee” while you’re completing the training. Once you complete the training, your rank will revert back to whatever it was before re-taking the training. What's with all the points? Weather Wizard: 500,001 points AND UP! STRIP CHARTS: How does it work? The process for digitizing strip charts happens in three steps: Image Preparation, Data Collection, and Quality Assurance. 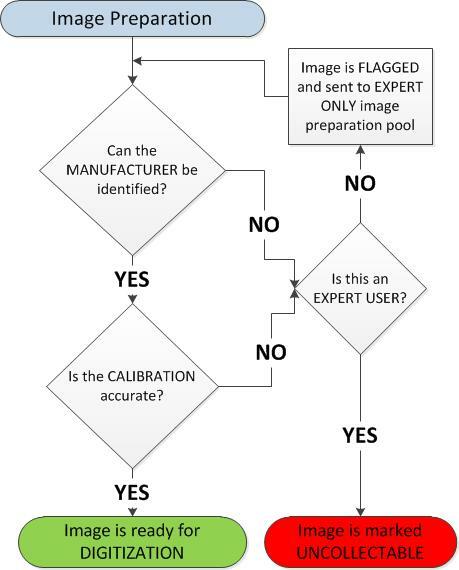 In this step, users identity the MANUFACTURER of the strip chart, and identify a calibration area on the image. Calibrating the image correctly is extremely valuable to the data collection process. Here, users leverage a number of tools to digitize the amount of rainfall that was recorded on the strip chart. First, users determine the number of inked lines that are visible on the image (many weather stations reuse paper strip charts for up to TEN days). Then, users will click on the top line of the image to start the process of locating the rainfall data points. Once the “dots” have been placed on the image, users can move them as needed to ensure the most accurate data possible. Most users will not see this part of the process, as it is available only to EXPERT USERS of the system. Each specific data collection project will have its own experts. In this step, the experts will determine if the data collected is good. If the data is good, then digitization is complete for the image. However, if there is something wrong with the collected data, the expert user will return the image back to the collection pool. Returning an image to the pool can be done a maximum of THREE times. Once it reaches this “three threshold,” it is placed in a special pool that allows expert users to determine the correct data and finalize the image. These functions are performed by varying levels of users. The Image Preparation and Data Collection processes can be performed by anyone registered to use the system. The Quality Assurance process can only be performed by Expert Users. Expert Users are designated by system administrators and are not based on rankings. 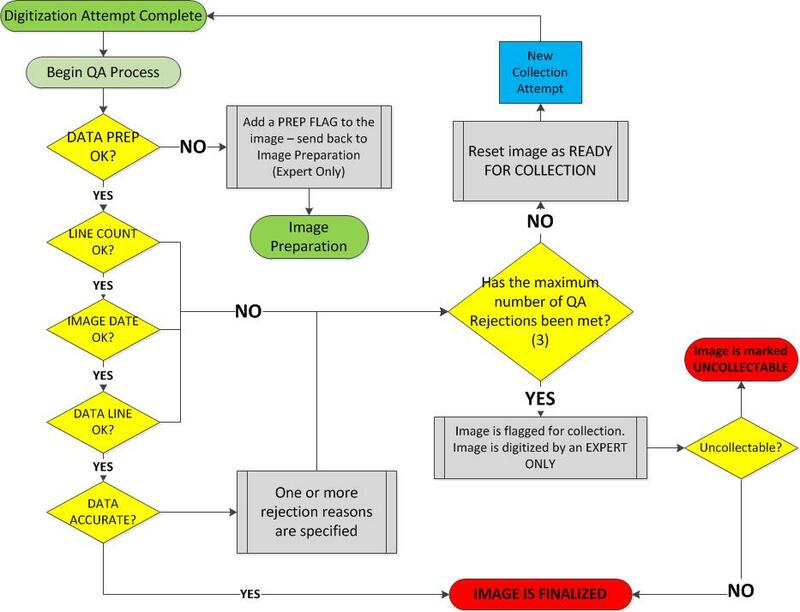 Once an image has completed steps 1 and 2, it is sent to the Quality Assurance process. Here, expert users add some required information, and validate that the data is correct on the image. If the data is correct, the image in finalized and the digitization process is complete. Theses images will no longer be available to users for any process. If the data is NOT accurate, the Expert User will return the image back to the data collection process. Images can be returned a maximum of 3 times. After the Third attempt, images are only available in the collection process to Expert Users. Expert Users have the final say, and their collection efforts will result in a finalized image.